WILLEMSTAD - The new station ship of the Caribbean Defense will arrive in Curacao for the first time this Monday morning, December 3. Because it is the first time that the station ship enters the Anna Bay, the entry is accompanied by the traditional ceremony. 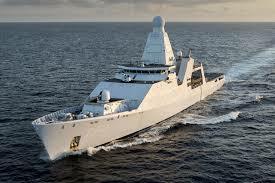 Zr.Ms. Zeeland, an Oceangoing Patrol Vessel of the Royal Netherlands Navy, sails past Bastion Marichi around 08:30, also known as Fort Krommelijn. At this time a salute is given to the kingdom flag. From Fort Krommelijn this salute is answered with 21 cannon shots. The last shot of the salute to the distinction flag of the Governor of Curacao is at 09:00 at Fort Amsterdam. The Zeeland is used as a 'station ship in the West' for almost five months to intercept drug transports and to support the Coast Guard. In addition, the ship and its crew can provide assistance after, for example, a natural disaster. In order to carry out her duties, the ship is equipped with 2 fast deployable FRISC boats, a maritime NH-90 combat helicopter and a special guard team, consisting of navy officers who can board other ships. In the Caribbean there is still a so-called 'Law Enforcement Detachment' from the American coastguard on board.